I meet a colleague who refuses to shake my hand or kiss me hello. She has been body-checked by the dreaded lurgy… falling victim to the massive human petri dish that is the PNE. “But it’s okay, I’m not contagious anymore,” she assures me. My immune response is less assured. In a feverish sleep the next day, I dream that a tweet I send goes viral and starts growing my followers into the thousands. I diagnose myself. In addition to exhibiting early symptoms of a seasonal cold, I have a mild case of nature-deficit disorder… It’s clearly time for an e-tox. In 2005, winner of the 2008 Audubon Medal Richard Louv coined the term, acknowledging a trend of disengagement between children and the natural world that may correlate with growing rates of anxiety, depression, obesity and attention deficit problems. Steve Casimiro responded to the tale of five brain researchers who went off-line and floated the San Juan River for a week to test the impacts of technology on their grey matter, by channelling Homer Simpson: Duh. The cure, quite simply, is to go outside. Play. Wander off the marked trails. Seek wild spaces. 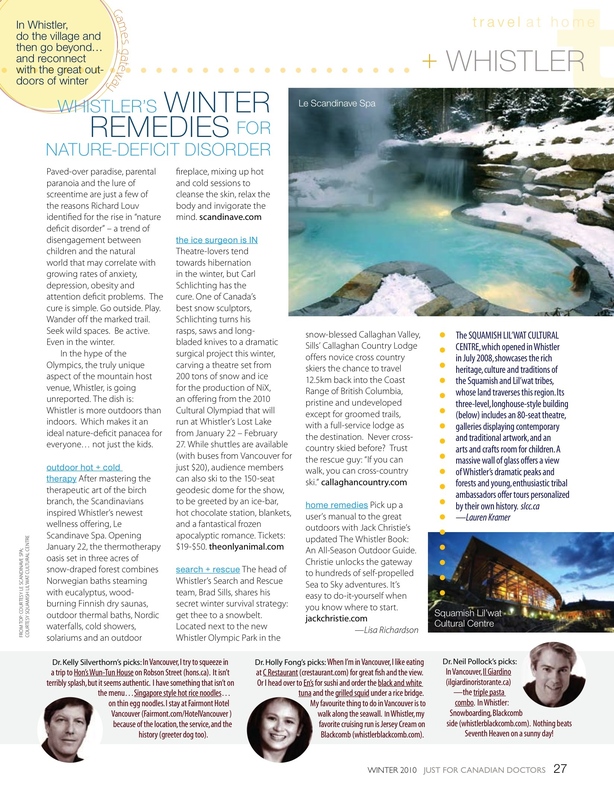 I rounded up a couple of “winter remedies” for nature-deficit disorder for the Winter 2010 issue of Just for Canadian Doctors magazine. At the time, it got me thinking that the one good thing to come out of the 2010 Winter Olympics would be a generation of kids who turn off the television after the Closing Ceremony, grab skates, skis, boards, and rush outside to become participants. Time for some tending of the wild spirit within. That is, once I get out of bed.